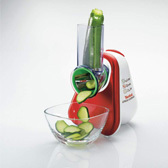 On the first day of Christmas Tinned Tomatoes gave to me ............. a Tefal Fresh Express Food Slicer from Argos. 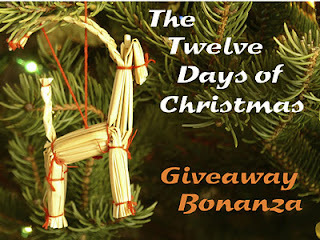 Oh yes indeed it's December and time for me to give something back to my readers. Over the next 12 days I will announce a new giveaway each day and the winners will be announced over the 12 days of Christmas starting with Christmas Day. So, if you live in the UK and would like a very special delivery, then just enter for a chance to win. I am very excited by my first giveaway. I have been wanting one of these beauties for a while and Argos have kindly provided one for me and one to give away. Argos are great for kitchen products from white goods to small electricals like this. Unfortunately, my slicer just arrived today, so I haven't had a chance to use it yet, but I can't wait. Just think how bonnie my salads are going to look. The Tefal Fresh Express chops and slices, grates and shreds fruit, veg, cheese or even nuts. What is different is that Fresh Express has a 150W motor which makes food preparation absolutely effortless. All the attachments are suitable for dishwashers and the attachments neatly store away in the unit. It also save you the hassle of getting a big food processor out. If you would like to win one of these just add your entry to the rafflecopter widget below. Good luck everyone! Remember to come back each day for a new giveaway. 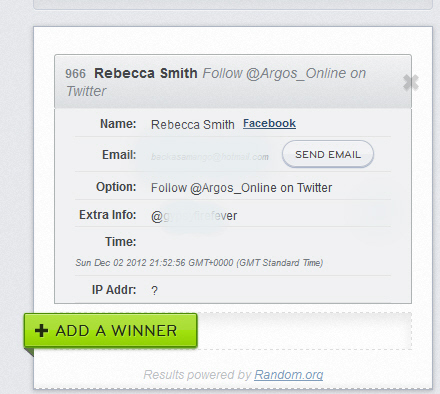 This giveaway has now closed and the winner has been selected. Congratulations to Rebecca Smith. oooh, that would save my fingers! Wohooo I've seen these love them !!!!!! That looks so handy. One of those gadgets that you don't realise you need until you get it. This looks great and so much safer! Would love one as I am very dangerous with sharp knives! Such a great time saver! Cooking would be so much more fun and appealing after a long day at work! Perfect with Christmas coming and so much chopping to do!!! Thanks for the chance to win this handy dandy gadget! Ooh I'd love one of these... I bought a chop wizard a while ago and all my fruits and vegetables when cooking are now in neat little squares. This would be fun to mix up the geometry in my kitchen! Plus it would make it easier when cutting up potatoes to go on the top of a hot pot. I love a good hot pot! I've been trying for ages, and I just can't get the rafflecopter widget to work! I've not had a problem with one before, but it just says 'loading' and can't use it! Thank you so much for offering such a generous giveaway. Thanks for such an awesome chance! This would make food prep easy! It would be interesting to see if food tastes *quite* the same without the usual garnishes of grated knuckle and sliced fingertip! Thank you Santa Jac! Looking forward to this as I don't have an advent calendar. 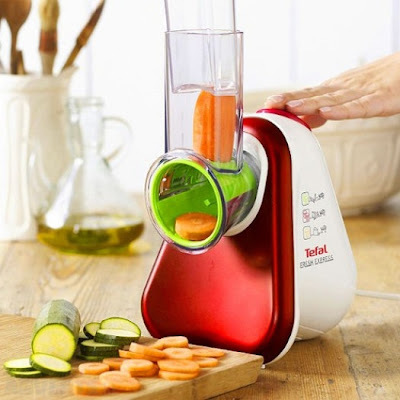 OOh what an absolute must have in the kitchen - this would make meals for my LO a breeze as he likes his veggies cut up and my fingers hurt when I'm grating. this would save me so much time! I haven't seen this before and am impressed by it's neat size and appearance and it's modern clean looking design. Fantastic prize - would certainly save some time in the kitchen! Looks like a brilliant addition to the kitchen! woule love to win this! I love functional and beautiful at the same time. This fits both categories! This would be helpful as it would stop the vegetarian in the family eating meat, mainly from my fingers!! This looks so useful! I hate grating cheese, so this would be really helpful. It looks easier than lugging a big food processor onto the kitchen worktop. Very useful if you're lazy like me! That would make it so much easier to prepare my soups! Great prize! It looks a safe gadget, would love to try it! This looks like a super updated version of something my mum used to own - dead handy! I could do with one of these please! Definately a useful gadget, would cut down time when a large amount of slicing is needed. This is perfect in my cooking...I use lots of veggies in my cooking.. This would indeed be very useful when making stews, casseroles and soups. I love little machines like these! This looks great, would save so much time! I spied this on another blog last week - such a smart little gadget! Looks perfect for slicing and chopping. Brilliant timesaver and a lot neater than my chopping efforts. This looks very handy indeed! Brilliant competition! my partner would love this, he hates chopping veg! Im lazy, seriously lazy, this gadget is most definately for me! Looks like that would save some time. what a great little gadget! I've seen these on TV and thought they look really handy - would love one. i'm such a lazy cook,this would be perfect for me! my fingers would be safe! I saw this product and laughed.. Not because it looks odd, but because I have just come from a website where there was a story about a man getting his man bits stuck in a place where it shouldn't be!! Lets hope his wife doesn't buy him one of these for christmas. HAHAH! looks fantastic ! my knuckles always end up getting grated and this would be just the job i love this ! I want one of these very much please! Looks perfect for stiry fries! I could definitely do with one of these. Please enter me. Thanks. I'm intrigued, and anything that saves my nails from the super-sharp chopping knife gets my vote! I love new kitchen gadgets. A very handy and well thought out gadget. In short, a must in the kitchen! Great prize! Would come in handy. Thanks, I'd love something like this to save me time in the kitchen! Oh wow - this looks fab! Looks a great product...I do love a kitchen gadget! I think this looks ace! No more sliced fingers - just what I need! That looks like it will save lots of time and my finger tips. Great giveaway my Mum would love this. Very nice - just what I need! I have been eyeing this up for a while now, think they look great! Sooo want one of these! Been on my wish list for a while! Never seen this, but looks like a really handy kitchen gadget! good bit of kit for the veggies from my allotment. Now this would come in handy over Christmas - especially with 12 of us! 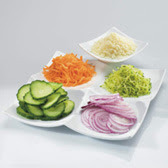 Love sliced food, made easy and safer for fingers! Oh I could definitely do with one of these. My knife skills aren't up to much! !